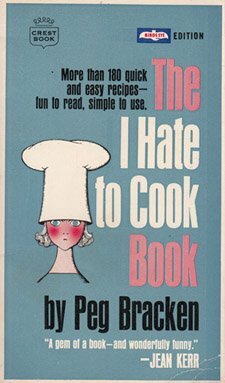 by Peg Bracken | Cooking, Food & Wine | This book has not been rated. Thank you so much for the wishlist book! I don't really hate to cook, I just hate to cook fussy recipes. My cooking style is pretty much "throw whatever is in the fridge/cabinets into a pot and consider it done when you get tired of waiting." It works well for soups, chilis, curries, stir fries and things like that, but I'm hoping this book has some other fuss-free ideas for things to make! This was a fun read, with recipe descriptions like "very easy; very good with beer; good without it too" and descriptions of ways to get out of cooking or make the easiest dish possible when required. This is headed out to the winner of the Non-fiction Sweepstakes. An awesome book! When making myself some food I prefer stuff that is simple and fast to make! So this appears to be the perfect book for me! Thank you very much for this book and the labels! Sent for the Culinary Sweepstake! I hope you'll enjoy it! Althoug I haven't tried any of the recipes, it was fun to have a look in it! Thank you for sending me this book. The title suits me to a tee. I hate to cook and so the short and simple recipes are at least within my ability and inclinations to try.